The RPCS-001 provides a highly portable and customizable computing system in a hardened enclosure that is ready for your most demanding applications and punishing environments. 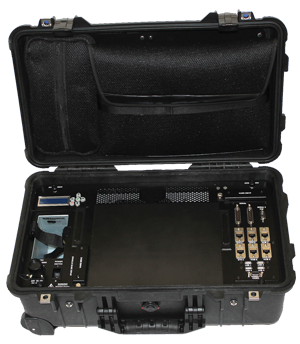 Designed for rapid deployment and featuring internal electronics (CPU, memory, I/O, peripherals) that can be easily preconfigured and modified, the entire system is contained in an airline carry-on sized roller case with a telescoping handle for superior convenience and mobility. Inside is a powerful mobile i7-based embedded rugged computer with all external I/O routed to a top panel under the case lid — and all I/O can be customized to meet your requirements. The RPCS-001 also features fanless, nearly silent operations and multiple hard drive, network, and AC/DC power options. Storage pouch for laptops, cables, etc. Lid must be open during operation. Cooling is achieved via screened vents in top panel and passive heatsink. Storage pouches are included in the lid for cables and other accessories.